Shasta. I'm not sure what's going on with Kate - I think real-life is consuming her at the moment. So I'll answer your questions and I'm sure that Kate will be OK with my choices. As far as hex codes for the woods, I might not have any. I'll probably "colorize" instead of "colorify." I "eyeball" colors a lot And the "colorize" numbers will be different almost every time, but it'll still be (hopefully) consistent. It's so great to see people working together on a project like this. To be honest, what I tend to do, is use the base wood and then use a shading and/or overlay texture to give the different colours. (I expect similiar to your tone-on-tone wallpapers). If you use the colourify or colourize or standing on your head and pixel-by-pixelling it, I don't think it matters as long as they standardise across the range. 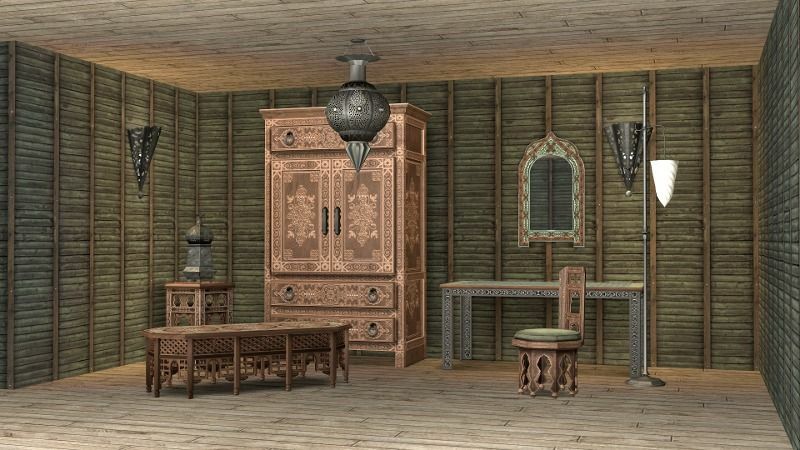 Moroccan furniture and build is fairly unique and as long as they all match, we're good. I've looked at your defaults and downloaded them, thought they were lovely - I don't see why our defaults can't mix and match. I'm doing all my defaults as non-defaults as well so it makes them way more mixable and matchable too. I do tedious everyday, it's called repository, so I really don't have a problem with doing wallpapers. I can also do the Art Nouveau collection, just tell me what I'll need and I'll tackle the bad boys. Kiri, my email is [email protected]. You may send as many batches as you like. I have a renamer program but I also do a lot of my work in SimPE so it's easy to rename walls that way as well. Kiri, most people call me Hafi but you can feel free to call me Sarah. It doesn't really matter to me. I've gotten the first mail, for some odd reason hotmail sent it to the junk bin. No worries Kate - you take all the time you need - you've already done a huge amount, so it's only fair that you get to spend some time on real life. I'm happy to hold the fort to keep things moving. I'm going to be posting up some default doors once I've done the pictures. Sarah - it was probably because of the links - for some reason hotmail doesn't think real people send links! The second email hasn't been sent yet - it took yahoo/my internet about an hour to load, and I went to bed in the meantime. I'll send it off today. Shasta - It's an awesome set. I really do need to download your blog.